Cavender’s Brooks & Dunn Houston Rodeo Giveaway entries must be made by 2/17/2019 at 11:59 PM CST. Winners will be announced and contacted by Facebook direct message and email by 2/18/2019 date. No Purchase Necessary to enter or win. A purchase will not increase your odds of winning. Subject to applicable federal, state and local municipal laws and regulations. Contest begins on 2/11/2019, and will end on 2/17/2019 at 11:59 PM CST. 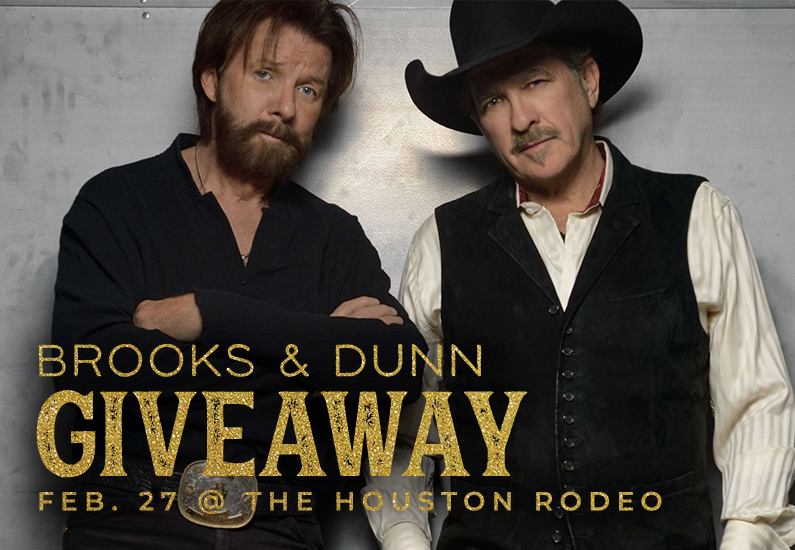 One (1) winner will be selected at random from entries to receive a prize of two (2) tickets to see Brooks & Dunn in concert at the Houston Rodeo on Wednesday, February 27, 2019 and a $100 Cavender’s gift card. Travel expenses are not included in prize. Prizes are non-transferable and no substitution will be made except as provided herein at the Sponsor’s sole discretion. Sponsor reserves the right to substitute a prize for one of equal or greater value if the designated prize should become unavailable for any reason. Winner is responsible for all taxes and fees associated with prize receipt and/or use. Odds of winning a prize depend on the number of eligible entries during the Sweepstakes Period. One (1) prize per person. Must be eighteen (18) years of age or older to win. This contest is open to residents of the contiguous 48 states plus Alaska and Hawaii. Void where prohibited by law. Employees of Cavenders.com, Cavender’s, vendors of Cavender’s, their families and significant others are ineligible. To enter, visit Facebook.com/Cavenders and follow the instructions on the giveaway post. No purchase necessary to win. Cavender’s will only use personal information to notify you if you are chosen as a winner. Winner will be selected at random. Odds of winning depend on the total number of entries received by the due date. Winner will be notified via Facebook direct message followed by an email from a representative of Cavender’s. Winner must respond to notification by email or phone in order to receive the prize. In the event that the winner does not respond within 48 hours of notification, a new winner will be selected at random. Prize will be mailed to the winner as soon as a response to the notification is received. Prize are not assignable and nontransferable. No substitutions allowed by the winner. Prizes are not redeemable for cash. Winners are solely responsible for reporting and payment of any taxes on prizes. Prizes not won or claimed by eligible winners in accordance with these Official Rules will not be awarded and will remain the property of Cavender’s. Winner will be posted below after the completion of this contest. By entering this contest, you agree to be bound by these rules. Winner releases Cavender’s, the prize manufacturers, and each of their affiliates, officers, agents, and employees from any responsibility or liability in connection with any loss, accident, or death incurred in connection with the use of the prize won in the contest. Any tax liabilities are the responsibility of the winner only. Prize is not exchangeable, transferable, or redeemable for cash. Cavender’s reserve the right to cancel, modify, or suspend the contest at any time, reject any entry, or make any revisions to the official rules as we deem necessary. The invalidity or unenforceability of any provision of these rules shall not affect the validity or enforceability of any other provision. In the event that any such provision is determined to be invalid or otherwise enforceable, these rules shall be construed in accordance with their terms as if the invalid or unenforceable provision was not contained therein. This giveaway is in no way sponsored by Facebook. The decisions of Cavender’s regarding the selection of winners and all other aspects of the Contest, shall be final and binding in all respects. Entries must be submitted by August 20, 2018 at 10:00 am CST. The winners will be contacted by direct message on Facebook by August 20, 2018. NO PURCHASE NECESSARY TO ENTER OR WIN. THIS SWEEPSTAKES IS AVAILABLE ONLY THROUGH THE CAVENDER’S FACEBOOK PAGE. IT IS OPEN ONLY TO RESIDENTS OF THE UNITED STATES WHO ARE 18 YEARS OF AGE OR OLDER, OR WHERE PROHIBITED BY LAW. A PURCHASE WILL NOT INCREASE YOUR ODDS OF WINNING. Sponsor. The sponsor of this Sweepstakes is Cavender’s 2019 WSW Loop 323 Tyler, Texas 75701. (“Cavender’s”). Prizes. Five (5) winners will be selected at random from comments left on the giveaway post on Facebook.com/Cavenders. 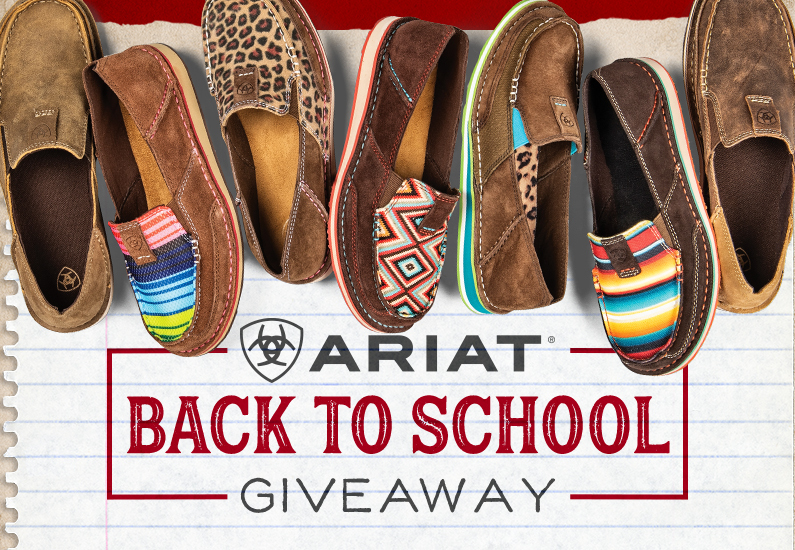 Each winner will receive a prize including three (3) pairs of men’s or ladies’ Ariat jeans, and one (1) pair of men’s or ladies’ Ariat Cruisers shoes. Winners will be able to select prize from select styles – prize valued up to $329.96. Eligibility. This Sweepstakes is available only through Facebook.com/Cavenders. Employees of Cavender Stores, Ltd. and Cavender Out of State Stores, Ltd., (more commonly referred to as Cavender’s Boot City, Cavenders.com, Westar Marketing), vendors of Cavender’s Boot City, their families and significant others are not eligible to enter or win. Entering. This Sweepstakes begins online August 13, 2018 and will end on August 20, 2018 at 10:00 am Central Time. To enter, visit Facebook.com/Cavender and leave a comment answering the question asked under the sweepstakes photo. No photocopied or mechanically reproduced, including facsimile, mail-in entries will be accepted. All entries received are the sole property of Cavender’s. Winner’s Selection, Notification and Acceptance. The winners will be selected at random. The odds of winning will depend on the total number of entries received by the end of the entry period. The winners will be contacted by direct message on Facebook and must respond to the notification within 7 days in order to claim the prize. In the event an entrant does not respond within 7 days after notification, a new winner will be selected at random. The prize will be mailed to the winner at our expense promptly after the response to the notification is received. The prize is not assignable, transferable, or redeemable for cash, and no substitutions by the winner will be allowed. The winner is solely responsible for all expenses, costs or fees associated with acceptance and use of the prize, and is solely responsible for reporting the receipt of the prize to all applicable taxing authorities and payment of any taxes due as the result of such receipt. If the prize is not claimed by an eligible winner in accordance with these Official Rules, it will not be awarded and will remain the property of Cavender’s. Upon fulfilling the prize, Cavender’s will be deemed to have awarded the prize to the winner, and the winner assumes full responsibility for the prize. Cavender’s reserves the right, in its sole and absolute discretion, to (i) choose one or more alternate winners, and (ii) disqualify any entrant that it believes violated or potentially violates any of the Sweepstakes requirements set forth herein or otherwise fails to comply with any provision of these Official Rules. General. By entering this Sweepstakes, you agree to be bound by these Official Rules. All federal, state, and local laws and regulations apply. The decisions of Cavender’s regarding the selection of the winner and all other aspects of this Sweepstakes shall be final and binding in all respects. Cavender’s reserves the right, in its sole and absolute discretion, to reject any entry or make any revisions to these Official Rules. DISCLAIMERS. CAVENDER’S MAKES NO WARRANTIES, EXPRESS OR IMPLIED, ORAL OR WRITTEN, CONCERNING THIS SWEEPSTAKES OR ANY PRIZE AWARDED. ANY IMPLIED WARRANTIES THAT MAY BE IMPOSED BY APPLICABLE LAW ARE LIMITED IN ALL RESPECTS TO THE DURATION OF THIS SWEEPSTAKES. IN NO EVENT WILL CAVENDER’S OR ITS VENDORS AND THEIR RESPECTIVE DIRECTORS, OFFICERS, MANAGERS, AGENTS, REPRESENTATIVES AND EMPLOYEES, OR ANYONE ELSE INVOLVED IN THE CREATION OR OPERATION OF THIS SWEEPSTAKES, BE LIABLE FOR ANY DAMAGES WHATSOEVER, INCLUDING WITHOUT LIMITATION DIRECT, INDIRECT, INCIDENTAL OR CONSEQUENTIAL DAMAGES. The above disclaimers do not apply in states where prohibited. Limitations on Liability. By participating in this Sweepstakes, you release and hold harmless Cavender’s, the prize manufacturer, and their respective affiliates, and such entities’ respective directors, officers, managers, agents, representatives, and employees, from any and all liability for injuries, loss or damage of any kind arising from or in connection with this Sweepstakes or any prize won. Cavender’s is not responsible for stolen, lost, illegible, mutilated, postage due, misdirected, delayed or late entries. Cavender’s is not responsible for any incorrect or inaccurate information related to this Sweepstakes, whether the errors are typographical errors, postal errors, or any technical or human error that occurs in the processing of entries. If at any time for any reason that affects the administration, security, fairness, or integrity of this Sweepstakes, it is not capable of running as planned, including tampering, unauthorized intervention, fraud, or any other cause beyond the control of Cavender’s, Cavender’s reserves the right, in its sole and absolute discretion, to cancel, terminate, modify, reschedule, or suspend it. Construction. The invalidity or unenforceability of any provision of these Official Rules shall not affect the validity or enforceability of any other provision. In the event any such provision is determined to be invalid or otherwise unenforceable, these Official Rules shall be construed in accordance with their terms as if the invalid or unenforceable provision was not contained herein. Jurisdiction; Venue. This Sweepstakes is offered only in the United States. Texas law governs the operation of this Sweepstakes, these Official Rules and the disclaimers set forth herein, regardless of another state’s choice of law principles, and the exclusive forum and venue for any disputes relating to this Sweepstakes are in Smith County Texas. Identity of Winner Upon request, Cavender’s will provide the names of the prize winners upon completion of this Sweepstakes on CavendersRanch.com. This contest is in no way sponsored, edited or administered by or associated with Facebook. Entries for contest being on Friday, June 1, 2018, and will end on Sunday, June 10, 2018 at 11:59 pm CST. Online voting will begin on Cavender’s Facebook page on Monday, June 11, 2018 and will end on Friday, June 15, 2018 at 10:00 am CST. This contest is available only on www.CavendersRanch.com, and open to residents of the contiguous 48 states plus Alaska and Hawaii. Void where prohibited by law. Employees of Cavenders.com, Cavender’s Boot City, and vendors of Cavender’s Boot City, Westar Advertising and their families are ineligible. To enter, visit www.CavendersRanch.com and submit your photo of dad in cowboy boots, first and last name, physical address, email address, and telephone number. Photos must be original; any professional photo or copyrighted entries will immediately be disqualified. One (1) entry per person. No purchase necessary to win. Cavender’s will only use personal information to notify you if you are chosen as a winner, or if you wish to receive updates from Cavender’s in the future. Winners will be selected by a vote from Cavender’s employees. Facebook fan voting will play a role is selecting the winners, but the ultimate decision is based on Cavender’s votes. Odds of winning depend on the total number of entries received by the due date. Winners will be notified via email by a representative of Cavender’s. Winners must respond to notification by email or phone call in order to receive the prize. In the event that a winner does not respond within fourteen (14) days of notification, the winner will forfeit the prize. Prizes will be mailed to the winner as soon as a response to the notification is received. This contest is in no way sponsored, endorsed or administered by, or associated with, Facebook. Entries for contest begin on 5/4/18 and will end on 5/11/18 at 10:00 AM CST. Winners will be announced and contacted by email or on Facebook/Instagram direct message by 5/11/18 date. One entry per person, per day! A purchase will not increase your odds of winning. Subject to applicable federal, state and local municipal laws and regulations. Contest begins on 5/4/18 and will end on 5/11/18 at 10:00 AM CST. One (1) winner will be selected at random from online entries on CavendersRanch.com. One (1) winner will be selected at random from entries on Facebook.com/Cavenders. One (1) winner will be selected at random from entries on Instagram.com/Cavenders (@cavenders). Winner will receive one (1) Montana Silversmiths necklace, earrings and bracelet jewelry set valued up to $159.00. This contest is available only on www.CavendersRanch.com, Facebook.com/Cavenders, and Instagram.com/Cavenders (@cavenders) and open to residents of the contiguous 48 states plus Alaska and Hawaii. Void where prohibited by law. Employees of Cavenders.com, Cavender’s Boot City, and vendors of Cavender’s Boot City, Westar Advertising and their families are ineligible. This contest is not sponsored by Facebook or Instagram. To enter, visit www.CavendersRanch.com and fill out the giveaway entry form with name, mailing address, phone number, and email address. To enter on social sites, visit Facebook.com/Cavenders and/or Instagram.com/Cavenders (@cavenders) and leave a comment on the giveaway post answering “why your mom is the best!”. One (1) entry per person, per day. No purchase necessary to win. Cavender’s will only use personal information to notify you if you are chosen as a winner, or if you wish to receive updates from Cavender’s in the future. Winner will be selected at random. Odds of winning depend on the total number of entries received by the due date. Winners will be notified via email or by direct message on Facebook or Instagram by a representative of Cavender’s. Winners must respond to notification by email or phone call in order to receive the prize. In the event that a winner does not respond within fourteen (14) days of notification, a new winner will be selectesd at random. Prizes will be mailed to the winner as soon as a response to the notification is received. Prize is not assignable and nontransferable. No substitutions allowed by the winner. Prizes are not redeemable for cash. Winners are solely responsible for reporting and payment of any taxes on prizes. Prizes not won or claimed by eligible winners in accordance with these Official Rules will not be awarded and will remain the property of Cavender’s. Winners will be posted below after the completion of this contest. The invalidity or unenforceability of any provisions of these rules shall not affect the validity or enforceability of any other provision. In the event that any provision is determined to be invalid or otherwise enforceable, these rules shall be construed in accordance with their terms as if the invalid or unenforceable provision was not contained therein. The decisions of Cavender’s regarding the selectin of winners and all other aspects of the Contest, shall be final and binding in all respects. Houston Rodeo Ariat Text Giveaway entries must be made by 3/18/18 at 11:59 PM. Winners will be announced and contacted by text each Monday by 3/19/2018 date. One entry, per person!